Several years ago I was a member of a small business organization and was included in an article about small business owners setting up a retirement plan for themselves. The theme, of course, was “nest egg”, and the editors wanted some illustrative photos of us showing the nest egg theme, like holding bird’s nests or eggs or images along that theme. The nests and eggs the photographer brought were clever and colorful, but being an artist and studying birds for years, they didn’t do too much for me. I had suggested I would be photographed out in my backyard wildlife habitat and for the article I’d say something about studying and sketching birds and their nests, and originally I wanted to use one of the nests I had on hand with a few reconstructed eggs. That was too realistic, perhaps, so I went to the next idea—I make my living as an artist, so I’m literally “drawing my own nest egg”. Perhaps use that as a metaphor? So I had the sketch started and sat on the bench under my trees working on my sketch and that was the photo of me they used. I wish I could find the issue of the magazine that had my photo! It’s here somewhere, but things from a decade ago are in various places around my little house. Hence the sketch of the nest with eggs, which I still like just as a sketch too. But there’s another interesting element to this story too. I have maintained a website called The Creative Cat since 2009 to share my pet portraits, my stories and poetry, my photographs and write about topics of interest and concern to people who love cats and also pets and all animals. I write about backyard wildlife habitats as part of that, and aside from the feline art I regularly share I also share the birds and other creatures as well. In January 2010 I shared artwork “From the Lost Sketchbook” series, where I’d found a sketchbook from 2002 or thereabouts that I’d kept at my desk. This was a general purpose sketchbook and I used it for many things in addition to extemporaneous sketches such as illustrations and ideas, and it included sketches of my cats and a few other subjects. I was so happy to see it again so I scanned all the sketches that were pertinent to The Creative Cat and posted them. For all the cats and dogs I featured in my artwork on The Creative Cat, this sketch had the most views of any piece of artwork on The Creative Cat for several years. I have no idea why, but I’m glad readers enjoy it. Purchase the original or a print. This art is My Nest Eggs, Pencil, 6″ x 5″ on multi-media drawing paper. Cards are 5 x 7 printed on 14 pt. C1S, blank inside and available with a matching envelope. 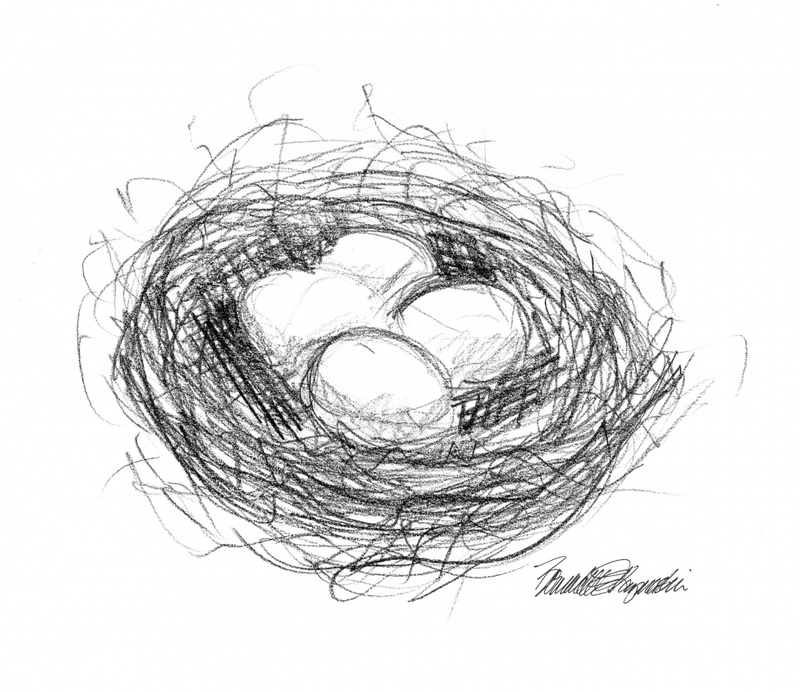 This entry was posted in pencil, wildlife art and tagged animal artwork, backyard, birds nest, eggs, nest, nest eggs, pencil sketch on April 16, 2017 by Bernadette.